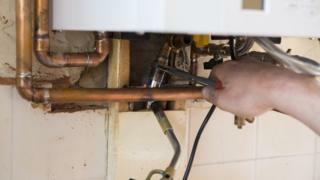 Greenhouse gas emissions from your heating boiler are fuelling climate change, a report by MPs has said. UK government advisers warn that emissions from housing have actually gone up last year. This is despite attempts to drive down emissions from the housing sector. The Committee on Climate Change (CCC) report says that all homes in future will have to virtually eliminate emissions from home heating to meet climate targets. The government said it’s committed to investing £6bn to improve the energy efficiency of lower income and vulnerable households in a decade. Some 14% of UK greenhouse gas emissions come from our homes, but little’s being done to reduce them. The committee’s spokesperson Prof Julia King told us: “This generation of home-owners is cheating its children by leaving homes which are completely inadequate for an age of climate change. What’s more, she said, many new homes don’t even meet building standards because they are poorly constructed. “These poorly-built new homes are going to need to be retro-fitted (re-insulated) 10-15 years down the line. It’s a total waste of money because retro-fitting is 4-5 times more expensive than building it properly in the first place. What should we do with existing homes? Tackling existing housing stock is difficult and expensive in the short-term – though it saves on gas bills in the long term. They should also have measures to reduce indoor moisture, improve air quality, water efficiency and protection in homes at risk of flooding. Ed Matthew, (SIC) from the climate think tank E3G told us: “The reason carbon emissions are rising again in homes is the decision by the Cameron government to slash funding for home energy efficiency. As a result, home insulation has crashed by 95% since 2012. The Treasury has typically been reluctant to invest in insulating private houses because it believes people who are able to pay should upgrade their homes without public money. “They seem to have missed the memo on the climate emergency,” Mr Matthew said. A government spokesperson said: “The UK has reduced emissions faster than any other G7 nation, and moving to a greener, cleaner economy while continuing to grow the economy is at the heart of our modern Industrial Strategy. The chair of the Committee, Lord Deben, is being investigated by the Lords Standards Committee to see if he has breached rules by not declaring income from firms that benefit from pro-active climate policies. Lord Deben says he has followed advice on the rules.